Wow, judicial changes, legislative changes, I don't remember so many changes coming at once like this. I'm not sure I'll recognize the landscape in these here parts! I hope Trump picks a great one for the seat. Hopefully a couple of SCOTUS Justices follow suit. ^^^ That would be great..
this case, like Heller and McDonald is just about self-defense. The Supreme Court has decided that the amendment confers a right to bear arms for self-defense, which is as important outside the home as inside. What does it mean to bear arms if there's no right to carry arms in a public place? You don't bear arms in your house, you don't march around with a gun over your shoulder right? His cat told him it was time. On one hand, he tossed his own personal beliefs to the side and interpreted Heller the way it was intended. On the other are his...not so great votes in cases such as Culp, Horsley, ACLU v. Alvarez, Skoien, etc. Even a stopped clock sometimes gets it right. Don't let the chamber door hit you on the way out. I think it's also good to note that Posner HATES guns with a passion. That's why he isn't on the Supreme Court...he wasn't, and still isn't a reliable conservative vote so Reagan put him on CA7. If it were up to him, and thank God it isn't, the "militia" would not be the people but the NG or some other form of reservist branch of the military. It shouldn't be surprising that he sees it that way, given that he was raised by a far-left mother who was a communist or communist sympathizer. heck, he once gave his train set to the children of Julius and Ethel Rosenberg after they were executed for treason. He doesn't believe it's an individual right, but he recognized that he was bound by Heller. And he got into it with Scalia over his opinion in Heller. That's why I respect the man. Deeply, and I mean deeply held personal beliefs about guns tossed to the side. I've also seen his holdings as a district court judge (sitting by designation) overturned by the Seventh Circuit. Even worse, the panel holding that the district judge (Posner) made an error and not one of the innocent variety. That's entertaining. The Second Amendment states in its entirety that “a well regulated Militia, being necessary to the security of a free State, the right of the people to keep and bear Arms, shall not be infringed” (emphasis added). The right to “bear” as distinct from the right to “keep” arms is unlikely to refer to the home. To speak of “bearing” arms within one's home would at all times have been an awkward usage. A right to bear arms thus implies a right to carry a loaded gun outside the home. And one doesn't have to be a historian to realize that a right to keep and bear arms for personal self-defense in the eighteenth century could not rationally have been limited to the home. Suppose one lived in what was then the wild west—the Ohio Valley for example (for until the Louisiana Purchase the Mississippi River was the western boundary of the United States), where there were hostile Indians. One would need from time to time to leave one's home to obtain supplies from the nearest trading post, and en route one would be as much (probably more) at risk if unarmed as one would be in one's home unarmed. In my opinion, this is Posner interpreting the Constitution (correctly) apart from Heller and McDonald. Wow, I was wondering if Posner had gone cuckoo when he said that studying the Constitution was a waste of time and maybe he did. On the bright side, we have Trump filling the lower court vacancies. Yes and no. Yes, because he's filling the vacancies in red states and purple states (Indiana, Wisconsin, two examples). No, because the Senators from blue states are withholding blue slips for his nominees. 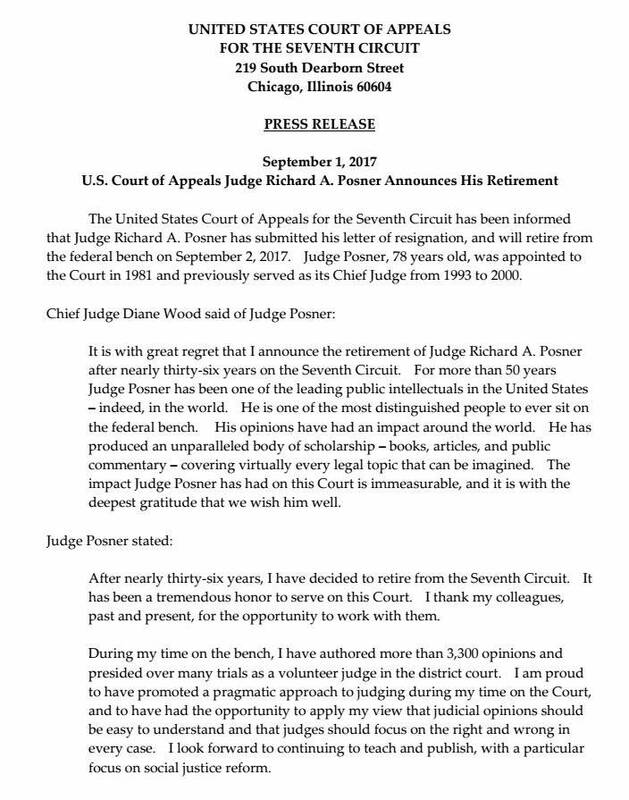 Since Posner's seat is technically in Illinois, whereas the vacant seat that Barrett is nominated to is in Indiana and the seat Brennan is nominated to is in Wisconsin for purposes of the judiciary (the seat occupied by Easterbrook was the last seat authorized by Congress), and we have two Senators who exemplify the Democratic Party logo, I fully expect them to obstruct any nomination to fill the seat vacated by Posner. The "blue slip rule" is alive and well. Al Franken used it on a CA8 nominee David Stras. Sen Klobuchar threatened to use it as well. I'm sure everyone has seen the attack by Feinstein and the rest of the leftists on the Judiciary Committee on Professor Barrett's religious beliefs. "The dogma lies within you" based on a paper she wrote 20 years ago. This sort of rule for circuit judgeships is asinine because the circuit's jurisdiction includes one blue state, Minnesota, and the rest are red states (the Dakotas, Nebraska, Arkansas, Iowa, and Missouri). So two Democrats can basically control who is seated on the Eighth Circuit, despite the fact that the circuit covers Minnesota (Franken and Klobuchar, Iowa (Grassley and Ernst), Nebraska (Sasse and Fischer), North Dakota (Heitkamp, who has little time left in the Senate, and Hoeven), South Dakota (Thune and Rounds), Arkansas (Cotton and Boozman), and Missouri (McCaskill heh enough said, Blunt). Out of those 14 Senators, only 4 are Democrat. They're obstructing, plain and simple. Actually the blue slips are a non-issue for him, and with Grassley ramming nominees through committee it makes things a lot easier than you describe. What’s particularly important is that as to Brennan for the 7th Circuit, Trump didn’t wait for a Wisconsin judicial commission to rule. Trump isn’t required to do so, anymore than he is required to wait for “blue slips” from Senators to move forward. Those and other non-binding traditions have been used by Democrats to slow down the process. Sen. Tammy Baldwin says a bipartisan Wisconsin commission that signs off on federal nominees never approved a Milwaukee attorney that President Donald Trump has picked to fill a federal appellate court vacancy. Trump announced Friday that he had chosen Michael Brennan to fill a vacancy on the 7th Circuit Court of Appeals. The slot has been open since 2010. The seat is designated for a judge from Wisconsin. Potential federal appointees from Wisconsin typically get vetted by the bipartisan Wisconsin Federal Nominating Commission. Baldwin’s office said the commission did not recommend Brennan as the nominee. Baldwin said in a statement that she’s troubled Trump has taken a partisan approach that disrespects Wisconsin’s process. This is consistent with what we reported in June, that the Chuck Grassley was prepared to force nominees through the Judiciary Committee due to Democrat stalling tactics. But he has to move more quickly given Democrat determination to slow things down.